Above: MODIS image from NASA’s Terra satellite of Category 4 Tropical Cyclone Gita as seen on Tuesday morning, February 13, 2018. The islands of Fiji are visible at the upper left. After devastating Tonga, strong winds from Tropical Cyclone Gita affected a tiny and remote cluster of Fijian islands: Ono-i-Lau, and Vatoa (combined population about 600). 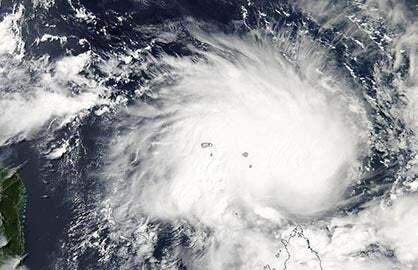 According to newsnow in New Zealand, Gita did not make a direct landfall in these Fijian islands, but communications are down, and damage is expected to be severe. Image credit: NASA. The most powerful storm in living memory for the South Pacific island nation of Tonga struck on Monday night local time, when the eyewall of Category 4 Tropical Cyclone Gita passed directly over archipelago’s largest and most populous island, Tongatapu. The nation’s capital, Nuku’alofa (population around 24,000), is on the island, and the nation’s Parliament House was destroyed by the storm. According to the weather.com write-up on the storm, 30 people were injured by Gita, but no deaths have been reported. Damage was widespread on the island, and it is likely that Gita will be the most damaging weather-related disaster in their history (current record: $71 million in damage in 2018 dollars from Tropical Cyclone Waka of 2001). A Facebook page called Tonganow - Online Community for Tongans is sharing initial damage photos, which include downed trees and power lines and roof damage. Newshub (New Zealand) shared Facebook reports of flooding at the Vaiola Hospital on the coast in Nuku'alofa. On February 9, Gita pounded American Samoa, where a state of emergency has been declared by President Trump. This frees up disaster assistance money. Public schools have been shut down for the week, and damage is substantial on the island of 50,000 residents. Sea surface temperatures (SSTs) are typically near their warmest point of the year in February across the South Pacific, and were in the range of 28-29°C (82-84°F) in the area that Gita traversed as it neared Tonga, which was about 1°C above average (Figure 1). As of 1500Z Tuesday (4 am Wednesday Tonga time), Gita had weakened to a Category 3 cyclone on the Saffir-Simpson scale, with top winds of 125 mph. Satellite loops showed that Gita was still a large and impressive system with a prominent eye, but the cyclone was under high wind shear of 25 – 30 knots, which was distorting the cloud pattern. Gita is predicted to steadily weaken as it arcs toward the west and eventually southwest. Gita should bypass other major island groups from here on out, but the storm or its remnants is likely to bring very heavy rain to the North Island of New Zealand on Monday. 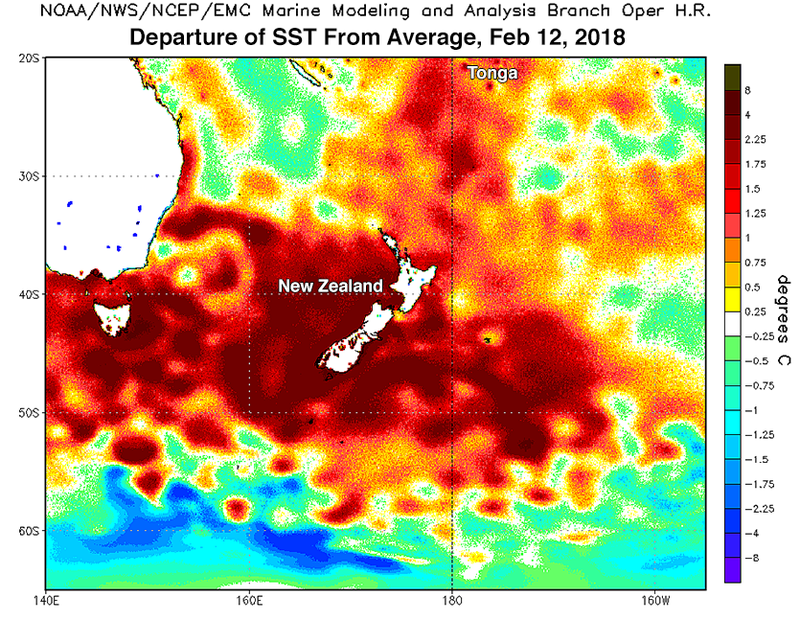 Record-warm warm SSTs off the west coast of New Zealand, which helped bring the country its warmest month in recorded history last month, will supply an unusually rich source of moisture for ex-Gita’s rains over New Zealand. This will be the second strong remnant tropical cyclone to affect New Zealand this season. The extratropical remnants of Tropical Cyclone Fehi brought significant flooding rains to New Zealand January 31 – February 2, resulting in tens of millions in damage, according to insurance broker Aon Benfield. Auckland, New Zealand has had triple its usual rainfall so far in 2018. Figure 1. Departure of sea surface temperature (SST) from average for February 12, 2018. Gita took advantage of unusually warm waters near Tonga, about 1°C above average, in order to intensify. Image credit: NOAA. Tonga consists a far-flung collection of 169 islands spanning roughly 500 miles from north to south. On average, about one tropical cyclone a year affects some part of Tonga, but Gita is by far the strongest on record to make a direct hit on the main island of Tongapatu. At landfall, the Joint Typhoon Warning Center (JTWC) pegged Gita’s top winds averaged over a 1-minute period at 145 mph, making it a Category 4 on the Saffir-Simpson scale (or a Category 5 on the alternative scale used in the Southwest Pacific). The central pressure of Gita as it approached Tonga was estimated by the Fiji Meteorological Service to be 930 mb. Cyclone Ian (2014) was another Category 4 storm, and packed top 1-minute sustained winds of 145 mph as it passed through Tonga’s Ha’apai islands. 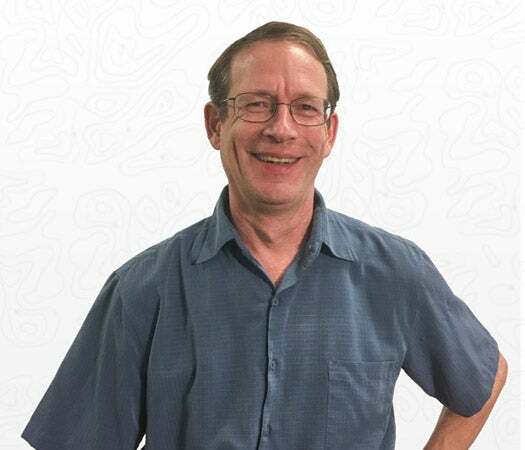 Ian decimated electrical and water supplies to the islands, destroyed roughly 500 buildings, caused at least one fatality, and left an estimated $48 million US in damage. 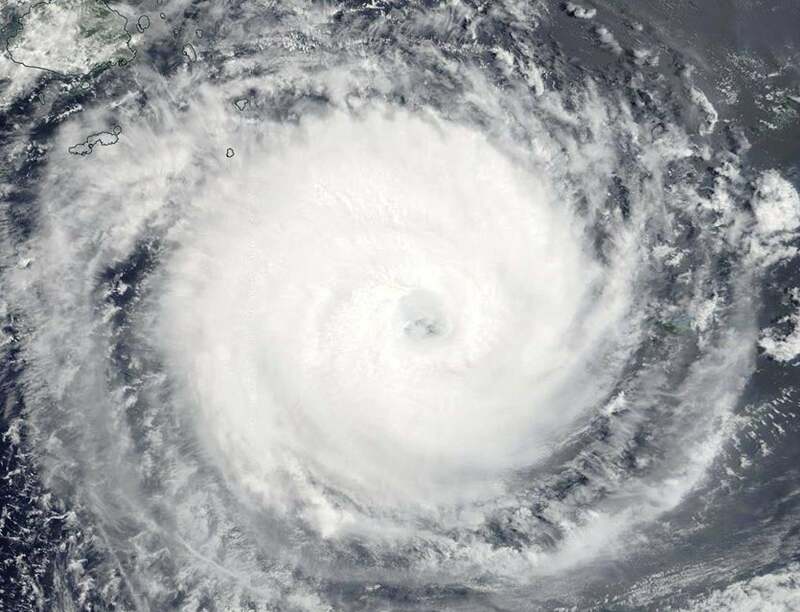 The deadliest cyclone in Tonga’s history was Cyclone Isaac of 1982, which passed through the Ha’apai islands about 50 miles northwest of Tongatapu. Winds reached 106 mph at Nuku-alofa, and damage was extensive across all three of Tonga’s island groups. 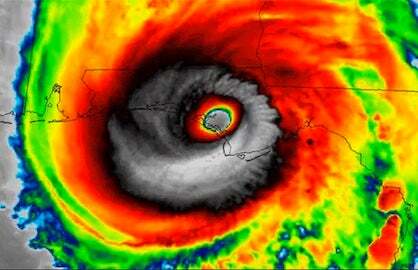 Isaac resulted in six deaths and left around 45,000 people homeless. Tonga has a cross-country skier competing in this year’s Olympics: Pita Taufatofua, famed for his shirtless, oiled appearance as the nation’s flag-bearer in the opening ceremonies. The first named storm of the 2018 typhoon season in the Northwest Pacific, Tropical Storm Sanba, made landfall in the southern island of Mindanao in the Philippines on Tuesday morning (U.S. EST) as a minimal-strength tropical storm with 40 mph winds. Sanba weakened to a tropical depression as it traversed the island, and satellite loops late Tuesday morning showed that Sanba was disorganized but had a large area of heavy thunderstorms. The storm will bring dangerous flooding rains to the southern Philippines through Wednesday. Sanba is expected to dissipate before reaching Vietnam on Saturday, but the storm will still be capable of bringing dangerous flooding rains to that nation. Sanba was the first named storm to form in 2018 in the Northwest Pacific, but was the second tropical storm to hit the Philippines this year. The islands were also hit this year by Tropical Storm Bolaven, which made landfall in Mindanao on January 1, killing three people and doing approximately $11 million in damage. Bolaven formed on December 30, 2017, though, and thus belongs to the 2017 typhoon season. According to archives of Northwest Pacific tropical cyclone activity maintained by Dr. Phil Klotzbach (Colorado State), the Northwest Pacific averages one named storm every two years by this point in the season.